Saving the earth is a will literally take a worldwide effort, meaning more and more countries are urging their people to do their part. One way ordinary people can contribute is through solar panel installation. In the Philippines, the sun never fails to shine, so maybe it’s time for our countrymen to also invest in clean energy. 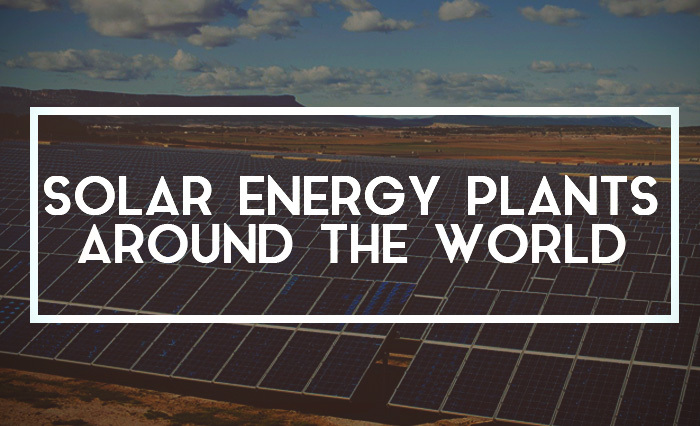 To show you just how much the people of earth are trying to save it, here are some solar energy plants around the world. This is the biggest solar plant in the world and it’s in California. It produces an amazing 579 megawatts of power and it supplies that power to a staggering 255,000 homes and over 13 square kilometers big. The plant uses Oasis Power Plant Technology which means that the panels follow the sun to maximize the sunlight. It’s estimated that the plant displaces 570,000 tons of carbon dioxide emissions, which is equivalent to removing roughly around 108,000 cars from the road every year. This solar farm located in Bordeaux, France, is the biggest solar plant in Europe and is producing 300 megawatts of power to supply about 300,000 homes. Chinese manufacturers supplied the plant with its solar panels. It was put up by Krinner, Schneider Electric, and Eiffage and was opened in October 2015, and is connected to the grid that provides electricity to the whole of France, Réseau de transport d’électricité. 21 companies worked hard to make this 345 megawatt solar plant a reality. It’s part of another solar plant that as a whole, they make an amazing 600 megawatts of electricity. It’s on a 20.2 square kilometer piece of land in the North of India in Gujurat. A solar park at Charanka which is on 5000 acres of land can produce up to 500 megawatts of electricity from solar and wind power. This solar plant sits in Arizona in the city of Yuma. It produces 290 megawatts of electricity that powers a 100,000 homes. The plant is owned by NRG Energy and MidAmerican solar, and is remotely operated by First Solar. The features of First Solar’s grid allow this to happen. The technology involved in the solar panels used and the operation of the plant led to the USA’s Department of Energy to grant them a loan of $967 million. This Chinese solar plant which was built in 2009, produces 500 megawatts of power. It is still under construction and when finished, another 60 megawatts of power will be added to its capacity. These huge solar plants all around the world proves that countries are serious about their oath to reduce greenhouse gasses, postpone climate change, and are well into the movement of saving the earth. The plants are scattered over huge patches of land, using technology we’ve never seen before, using the most of the most abundant and infinite thing on earth: sunlight. The amount of carbon dioxide that these plants displace might not be much yet, but if every country invests in clean energy, imagine the clean air available to every person, reducing not only the destruction of earth, but also the risk of diseases.